Steak and béarnaise is about as classically French as you can get. 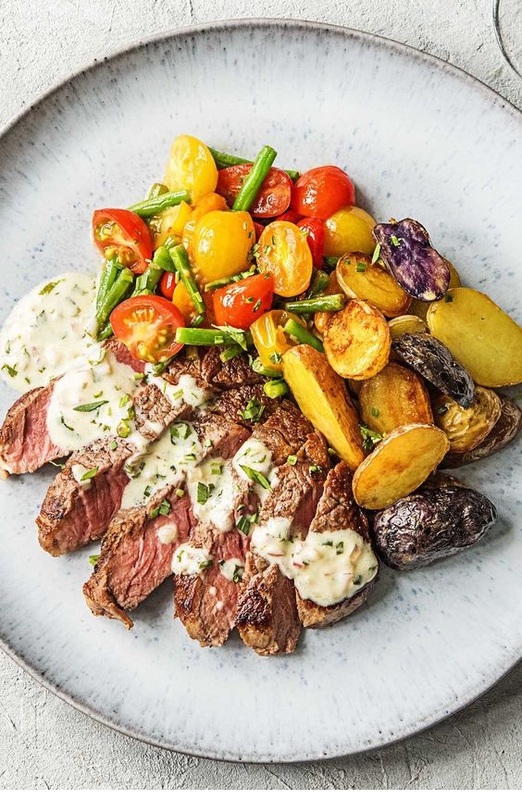 The thick, rich sauce is accented with tarragon and white wine vinegar to give it an herby, slightly tart accent that melds and meshes with the beef harmoniously. Wash and dry all produce. Preheat oven to 425 degrees. Halve potatoes. Toss potatoes with a large drizzle of oil on a baking sheet. Season with salt and pepper. Arrange potatoes on baking sheet cut-side down. Roast in oven until crispy and browned, about 25 minutes. Halve, peel, and mince shallot. Cut green beans into bite-sized pieces. Pick tarragon leaves from stems; discard stems. Finely chop leaves until you have 2 tsp chopped tarragon. Halve tomatoes lengthwise. Heat 1 TBSP butter and a drizzle of oil in a large pan over medium-high heat. Add 2 TBSP shallot. Cook, tossing, until shallot is translucent, 2-3 minutes. Pour in 1 TBSP vinegar (we sent more) and allow to evaporate, 1-2 minutes. Stir in half the tarragon and cook until fragrant, about 1 minute. Remove from heat. Stir in mustard and sour cream.